I am part of 2 sock clubs again this year, Janel Laidman and CookieA. I still do have some colorwork socks to make from last year’s club, but I did not want to miss out on this year. I am glad that I chose not to. The first big improvement in the collaborated clubs (in addition to a discount for signing up for both) was that instead of receiving both clubs at the same time, they are on alternate months. That means a new package every month, and always something to work on without feeling overwhelmed. Last year, since I was in both clubs, the yarn came later than the CookieA patterns. I usually got antsy, and started one of the 2 sock patterns from Cookie with some stash yarn. I am afraid that many of my Janel socks are still waiting to be knit up. 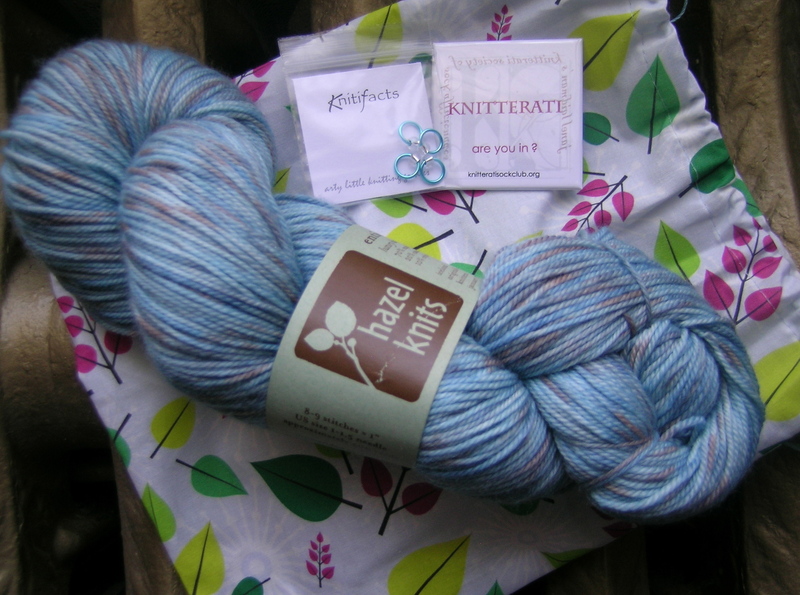 This year will be 2 sock patterns and 1 skein of yarn from CookieA in each shipment (along with 2 cookie recipes), and a sock and shawl pattern with 1 skein of yarn from Janel (one of which will always be a mystery knit-along). With both clubs, the yarn will be from a different Indy dyer each month so if there is something I do not like, I am not committed to it for the entire year. Admittedly, there was only one yarn base last year that I really had trouble knitting, and I get to try a great variety. I am finally breaking down and using my handspun yarn. This is the Raspberry to Cream gradient from Fiber Optic that I spun up in December. Refer to this post for a description of how I spun it up. I love how it wound up into a ball with gradient upon gradient. The pattern is a mystery pattern as part of the 2012 Janel Laidman sock club. I only have clue one, shown completed here, so obviously do not know how it will knit up, but so far I am really pleased with the progression. While I am not sure of what this shawl will end up looking like, I think that it is designed much like Arcadia by Janel for her Art & Sole club last year. So, if my theory is correct, we are at the center and will work back in decreases, then pick up along the long edge for a design. Not sure how the gradient will work on this, but it will be interesting, and since it will be wrapped around a neck, the color should add interest. 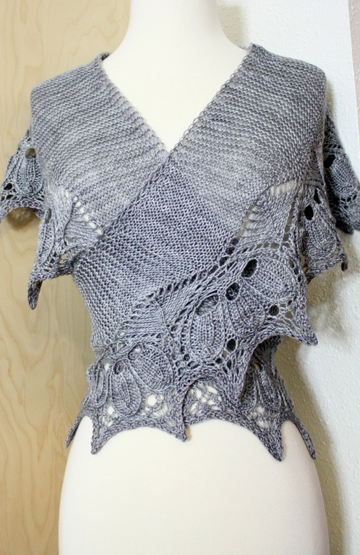 Are you the Raspberry to cream for socks or this shawl? 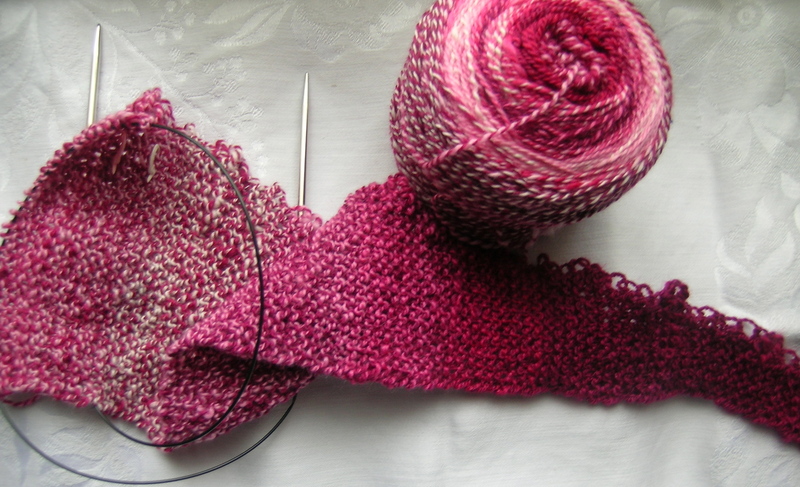 I am making the shawl with the Raspberry to Cream, I THINK that it will look something like the construction of the gray one i posted. We have been instructed to knit YO’s on the long edge, which I assume means picking up stitches and knitting in the opposite direction.